Found one file extension association related to AIC software and 1 file format developed specifically for use with AIC software. Advanced Image Coding (AIC) is an experimental still image compression system that combines algorithms from the H.264 and JPEG standards. More specifically, it combines intra frame block prediction from H.264 with a JPEG-style discrete cosine transform, followed by context adaptive binary arithmetic coding as used in H.264. 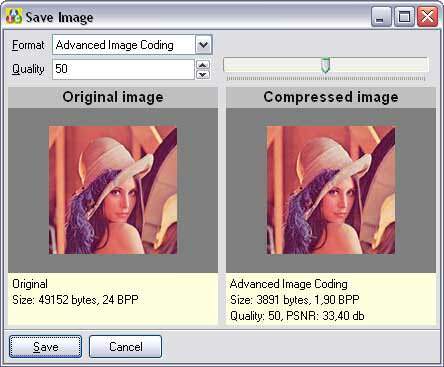 The result is a compression scheme that performs much better than JPEG and close to JPEG-2000. The AIC software is written for Windows 32-bit operating systems, including Windows 98, Me, 2000, XP and 2003, although I only tested on Windows 2000 and Windows XP. If you need more information please contact the developers of AIC software (Erik van Bilsen AudioVisuality), or check out their product website.